The exchange rate is one of the most important prices in an economy – and also one of the most variable. Hence understanding the effect of exchange rate movements on economic activity in general, and on international trade in particular, is a major issue for economists and for policymakers. The existing empirical evidence on the effects of exchange rate changes is inconclusive. A number of studies have focused on the aggregate effects of exchange rate depreciation, in particular the incomplete pass-through of exchange rate changes to import and export prices (Campa and Goldberg 2005, 2010). But aggregate effects such as these depend on the sensitivity of firms’ pricing decisions to exchange rate shocks, and evidence on these is scarce and admits a wide range of possible outcomes (e.g. Amiti et al. 2014, Berman et al. 2012). In a recent paper (Fernandes and Winters 2018), we provide quasi-natural experimental evidence on the effects of exchange rate shocks on export prices, quantities and export participation, by examining the consequences of the large, sudden and unanticipated plunge in the British pound following the Brexit referendum. The referendum result on 23 June 2016, in favour of the UK leaving the EU was almost wholly unanticipated. The pound had briefly appreciated following day-time predictions that ‘Remain’ would win, but once the result became known, it depreciated sharply (by around 10%) against the euro and the US dollar. And, as Figure 1 shows, it has stayed more or less at this level ever since. Our main result suggests that Portuguese exporters reduced their export prices to the UK market in euros by just 1% following the 10% depreciation of sterling. This implies that prices in sterling increased by 9% on average, a strong degree of exchange rate pass-through. Our analysis is based on uniquely disaggregated export data, from which we can examine, month-by-month, the export quantity and prices charged by the samefirm exporting the same product to buyers in the UK and in other countries. Assuming that the relative marginal cost does not change across markets within the same firm and product, this allows us to identify the effect of the depreciation of the pound on the markup in the UK market relative to that in other countries. We identify differences in the responses across firms, with large firms being prepared to absorb somewhat more of the exchange rate change into their margins than smaller ones. We also generate results on changes in firms’ propensities to export to the UK and on firm-level exports. Existing studies have shown that firms adjust export prices very quickly to exchange rate shocks, with most of the adjustment occurring within the first six months or less (e.g. Bonadio et al., 2018). Focusing on the first six post-referendum months allows us to be reasonably confident that we are locating the effects of the exogenous exchange-rate change rather than anticipations that Brexit would significantly worsen the UK’s long-run trading conditions. Over the last half of 2016 it was unclear when or how Brexit would occur, and the UK economy continued to grow on previous trends. We use data covering 2015 and 2016 (i.e. 24 months). Combining all firms, products and destinations, this gives us around 1.2 million observations. We capture the time-invariant differences between flows by including fixed effects at a firm-product-country level and between months by including fixed monthly effects. We identify the effects of the exchange rate shock by asking whether post-referendum exports to the UK differ from the rest of the sample after allowing for all these fixed effects. As noted above, after the depreciation, the price of the typical Portuguese export to the UK was 1.14% lower in euro terms than we would have expected on the basis of the firm’s exports of that product to other markets. Given that the depreciation of sterling was around 10%, this suggests that the price of Portuguese goods in the UK rose by around 9% – a very significant degree of exchange rate pass-through. We also estimate the effect using only EU markets as comparators, and the result remains similar: exporters drop their euro prices by around 1%. We show that larger – more productive – exporters reduce their price (in euros) by around 1.5%, absorbing more of the exchange rate change, while smaller ones absorbed none of it. This probably reflects higher market shares by larger exporters. 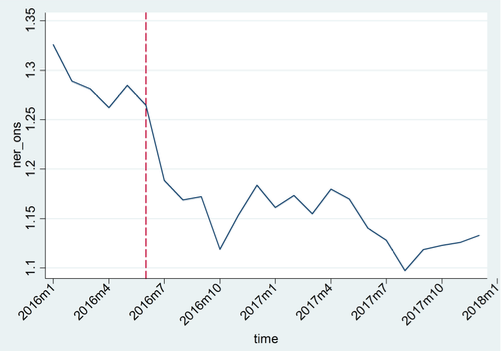 We separate the effect for consumer goods from that for intermediate goods for industrial use: exporters of consumer goods reduced their price (in euro) by about 2% as a result of the exchange rate shock, whereas intermediate goods did not fall in price. This may reflect the fact that consumer goods are more differentiated than industrial ones, so that their exporters can absorb more of the exchange rate change into their markups. We also ask whether firms that did not export to the UK over 2015 and the first half of 2016 were more or less likely to start to do so after the depreciation of sterling, and whether those that did were more or less likely to continue. In both cases, Portuguese exporters started to turn away from the UK market, with a particularly strong reaction among those which might otherwise have started to trade with the UK. Entry to the UK market was fully five percentage points lower than we would have expected. What will Brexit mean for European security? If we estimate the relationships by comparing values in a month in 2016 with those in the same month in 2015, we find the same pattern but with rather stronger effects on markups (2.8%) – that is, exporters appear to absorb somewhat more of the depreciation themselves. In addition, we find significant negative effects on quantities of exports. Overall, therefore, our uniquely detailed dataset suggests strongly that Portuguese exporters absorbed little or very little of the effect of a large and unanticipated depreciation of sterling into their markups. The vast bulk of the effect of the depreciation was visited on UK users and consumers of Portuguese goods. The UK is Portugal’s fourth largest market (and largest outside the euro area), but still its degree of influence over Portuguese pricing was very limited. With a large market on their doorstep, Portuguese exporters just did not seem obliged to accommodate market conditions in the UK very much. The lesson for the UK as it contemplates life after Brexit is that it is, in the technical sense, a ‘small open economy’. It has, pretty much, to accept the prices it is offered by the rest of the world and will have rather little ability to negotiate or otherwise achieve better trading terms. In terms of economists’ understanding of the effects of exchange rate changes in general, the strength of these results and the fact that they pertain to a significant trading relationship, suggests that exchange rate pass-through into the local prices of traded goods can be high, even in the short term.